The next chapter for this ol' New Orleans kit was preparing the interior divider walls for installation. I needed to come up with some wainscoting for the bedroom walls. I wanted something a little more detailed than the simple bead board I used in the stairway hall. What material do I have? How thick and wide should the trim be? Is this going to impact the next steps and if so what adjustments to the design or materials do I need to make? How will this meet the next wall and will the trims work nicely together? Luckily, I was able to find suitable materials, and even more luckily, I didn’t make a mistake and leave myself short like the stairwell boards, which hopefully, have been camouflaged enough that it won't be noticeable. Once I had the basic design and confirmed I had enough materials, the rest was pretty straightforward and methodical. I made panels for each section of the bedroom walls from 1/16" basswood, then made a frame overlay using 1/16" x 1/4" wood strips. The bottoms got 1/16" x 1/2" so they'll make perfect sized bases for the baseboards, which will be installed last. To the centers I added fancy Greenleaf door popout panels (leftover from the flower shop projects) and more Unique Miniatures embellishments. I constructed the basic boxes for the built ins on either side of the balcony door, then gave the right one "doors" using Houseworks wainscot panels and the left one faux drawers with more UM embellishment frames. Here's the test fit with tops made on the built ins. I am still debating about shelves for the left side, and have since painted what will be inside the built in recess the teal wall color (in a later photo). I also installed the hardware, gold to match the chandelier to be installed later, and the door handles. I won't install the wainscot top cap or the doors until after the walls have been installed. Once the bedroom walls had been finished as far as I could go I switched my attention to the bathroom walls. I cut the faux brick subway tile wall panels and wainscot trim, then set up the back wall and side wall on my cutting mat to test the fit. 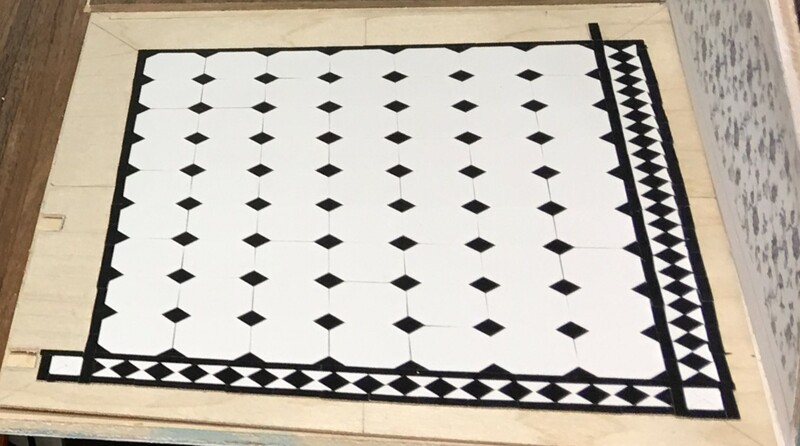 Once I was happy, I hand painted the tile panels with white chalk paint three times, sanding really smooth in between. Then, on three consecutive days, I layered on the triple thick spray glaze to get a nice tile shine. I won't install the panels to the walls until they've had several more days to cure. I've been saving an idea for the cabinets and sink for a long time, and am excited to finally be getting to work on it. I have a Town Square dining room hutch set and I'll be using the two side pieces from that for the cupboards, one on each side. The Bespaq dresser will be turned into the vanity sink. They all need to be painted and customized, so against all common sense, I took them apart. What we won't do for an idea!!! On the cupboards, I removed the mirrored backs, glass door inserts and the glass shelves, loosening the glue with my hair dryer. For such nice pieces, the glue job was truly sloppy. It took a long, patient while to carefully remove the glue from everything and sand smooth again. For the vanity sink, I removed all the drawers and doors, then loosened the top with more heat and a gentle force. Because the piece's countertop is already at 3", I decided on an undermount sink. I cut and sanded the hole, checking all along the way for fit and center. I am going to attempt a faux marble top like I did on some of the vanities I experimented with last year. The sink, a bisque bowl, will be painted white and then get the triple thick glaze sprayed on in several layers. I'll add the drain as I did with last year's vanities, too. For the bathtub, I am using yet another Chrysnbon bathroom kit, though I have a different toilet to use this time. I have not found a suitable alternative bathtub in style, authenticity or price since I began collecting for this project in 2016. I played with the idea of a shower, but every mock up made the bathroom close in on itself, and to place a tub/shower in the back meant losing the closet and the vanity impact - viewing it from the side just would't look as lovely. So I will place the Chrysnbon tub in for now, and keep replacement options open in the future. Kristine - please design and offer a fabulous tub in your Shapeways shop, will you? My little TinkerCad program is way too limited for something that curvy! All of the bathroom pieces are getting sprayed with black satin. I have the first couple coats finished and drying, but this time of year have to take things slowly. It's been a cold and wet week! The last big project for the second story is the flooring. I made the template for the areas getting Houseworks walnut wood flooring, same as what I used on the first floor, and then got that installed with the stinky Quick Grip. I like using that better than E6000 for the flooring because you only need to apply it to one side, which makes it easier to adjust if your first lay down attempt isn't perfectly aligned. I'm adding tiles to the bathroom floor as I get a few minutes to work on it, but I can tell you my tile job is not going to be perfect. I guess since it's my first time with this stuff I'll give myself a break and hope the really noticeable mistakes will be under the fixtures! Some experienced mini builders may have noticed or wondered why there will be wood floors under the walls. I'll have the answer, and hopefully, an ingenious alternative to those annoying and unrealistically out of scale thresholds on dollhouse doors in my next post. Hope you have a wonderfully fulfilling week! I really love how it's all coming together. The built ins and wainscoting are gorgeous. I think our bathroom is going to turn out so well. There is a tub in Kristine's shop but I don't think it has feet. Thanks Sheila! There are some things that are coming out good and I am liking them, and still others that are a real challenge and have issues to overcome. Overall I do like the house and I hope I'll forget about the flaws in favor of the whole when it's finally finished and ready to display! Me encanta el trabajo que has hecho! los suelos y paredes están quedando perfecto y preciosos. Un gran trabajo!!! Gracias pilar Creo que todos nos identificamos y nos apoyamos mutuamente porque hemos experimentado cuán difíciles y difíciles son algunas de estas tareas, ¡y realmente aprecio su aliento! Thanks Marilyn! If I can stack more in the "win" column than the "loss" column on this one, I think I'll come away feeling good about and loving the project, even though it's not quite as gorgeous as I had in mind, lol! Gracias carmen ¡Se siente bien tener tu apoyo! I am loving the bathroom so far! So exciting! Thanks Brandy! I hope all the tricky elements come together in the end to support the vision I have in mind! Toda la casa es espectacular. ¡Gracias Eloisa! Tuve grandes visiones para la casa, y aunque no soy tan hábil como necesito ser, ¡estoy feliz de estar aprendiendo tanto! ¡Precioso! Muy cuidados todos los detalles. ¡Gracias Isabel! Siempre sueño en grande y luego descubro que estoy un poco por encima de mi cabeza. Pero afortunadamente, ¡estoy aprendiendo mucho para el próximo gran sueño! Hi, Jodi - I feel really exhausted after reading this post! You are so ambitious! The bedroom is going to be lovely, with all the beautiful details and built-ins. I love your vision for the bathroom. You're brave to unglue those intricate pieces and put them back together again! I'm going to enjoy seeing these rooms come together; your plans are taking shape in a wonderful way. Oh Marjory! I know what you mean! As I get one tiny job checked off the list and start thinking about the next tasks I wonder why I make so much work for myself!!! But I am compelled to try, and so excited about the vision that I must carry on. I am so happy that you see where I am trying to go and like the choices! Thanks Deb! I am so happy you like the color and wainscoting! I often have second thoughts about the colors I choose, but not once with this teal - I love it too! There is always much trepidation when taking apart furniture, but just slightly less when I am using the scratch and dent pieces as with the dresser. Please continue to keep your fingers crossed for me, as there are several steps ahead, many of which could go wrong and ruin the plan! With the tile, it does not come with instructions of any kind, so I am discovering the hard way in which order the pattern should be laid to keep things straight and square. For the next one, I think I'll do much better!!! Thanks Maria! I am so glad you like the wainscoting and the color! I struggled with whether to go with the white or the teal, and I am so happy that I chose the color! Pulling the furniture apart is very nerve wracking and I definitely have to be in the right frame of mind. But nothing ventured, nothing gained so onward we march and hope for the best!!! Your dedication to Perfection is absolutely Awe-inspiring Jodi! I ADORE the look of the bedroom and the built ins on either side of the balcony door along with the carved panels on the wainscotting as well as above the door and window frames. This additional detail, is what gives this house its distinctive French flavour and immediately places the viewer into both a time and a location, but above all- they look like they SHOULD be there! This house has a long history and although it is currently being updated, its past character is not only maintained, but also enhanced. You are turning this house into a breathtaking beautiful one. The bathroom will be stunning. The black and white color combination is very elegant. It's wonderful how lovely this project is getting on. Thank you Drora! I had grand and fancy plans for the kit when I got it, and though it has been a huge undertaking, it is coming out as I had hoped in many respects. I admire your building skills! You made the job looks so easy. Whenever I try to build a little piece of something is never straigh neither professional looking. So not my favourite part. But I can tell that you enjoy that part, don´t you? Well Jodi, you got me excited, I can´t wait to see more progress. That bathroom is going to be superb! Thank you Alex! I am certainly far from being a skilled builder and find myself improvising at every stage. But luckily, many of the things that don't go perfectly are camouflaged in the finishes or overlooked for some other features. We are all learning in one way or another and it's wonderful to have friends like you to encourage us when we struggle to do our best in spite of our lack of experience or know how! Thanks Birgit! You are not slow - inspiration comes at it's own pace and for me the part that stalls me is not knowing what to do next! Plus, lonely nights force me to work and stay busy. I am not a creature built for being single, I guess! Navy blue is classic and fabulous, so you stay true to your idea! It's going to be perfect! I have much to do the next couple days, so we'll see if the black and white bathroom comes out like I see it in my mind - fingers crossed! I love the break front style of that dresser, and it looks wonderful in black! This is such a beautiful house. Despite your frustrations, it is turning out so nicely. Thanks De! I am beginning to believe that minis come with fiddly frustrations and that's just the way it is. If anything is ever easy again, I'll fall out of my chair!!! Thanks Sam - I am taking my cues from RL old homes and seeing the way they made good storage uses out of the funny little spaces rather than hiding them as we do in out modern homes. Measuring for them is proving to be challenging, and just when I think I have it right, I go to glue and have to readjust! Insert swear words here!!! There are good tub choices for ultra modern and for contemporary now, but classic claw foot tubs are hard to come by. So yes, the search goes on and if I find a good alternative I will surely spill the beans! Looks beautiful again, nice bathroom furniture and nice wallpaper. Thanks Gonda! I love the furniture style and I think the black will unify them! These finishes are so luxurious looking! It's going to be quite a spectacular piece once you're done. I love the way you incorporated the built ins into the wainscotting, that will look so pretty once complete. And the wall and floor tiles are stunning combined together. I really like the top moulding/trim tile piece that runs along the wall tile (I don't know it's name!) in the bathroom, and I can't wait to see the vanity put together! So many good things going on here! As for the tub... I have one modern-ish one, but I could make more. The thing is they're so so expensive! It's like $50 CDN for a tub :( It's ridiculous. I bought myself one, and I think I've sold two others total. I'll add some more styles in the future... I think sometimes we splurge if there is in item we simply can't find anywhere else. That's what I did when I bought my tub. Wish I could print it more cheaply, I know if I printed it on a local printer it would be 1/3 of the price (the quality would be different though). Looking forward to seeing your next update! Thanks Kristine! I have not been able to find that wainscot molding again since I bought it long ago, and I have just used the last of it. There is nothing like it I can find - all the ones I see are much more fragile and less detailed. I love your modern tub and would gladly pay that price when I am doing a more modern bath. What we need is a classic clawfoot that is a little more detailed and a little larger - Chrysnbon tends to be on the smaller side of 1/12th and so the tub looks small when used in conjunction with other mfg pieces. If you find a more economical way, you'd be selling all your designs like hotcakes!!! Everything you're working on looks fabulous, Jodi! Thank you, Megan! I am determined to just keep going in spite of the many challenges and setbacks! This house is like wrestling alligators! What a great idea to reform your dresser to a sink I'm curious how the top is going to look! Your work is inspiring! Thanks Marijke! I have done the top in faux marble - I'll have an update post in a few days, I hope!